“When Fire Meets Glacier” at the South Dallas Cultural Center with Alejandro Perez and Alia Mohamed. Late Night DMA with Jamal and The Bridge. 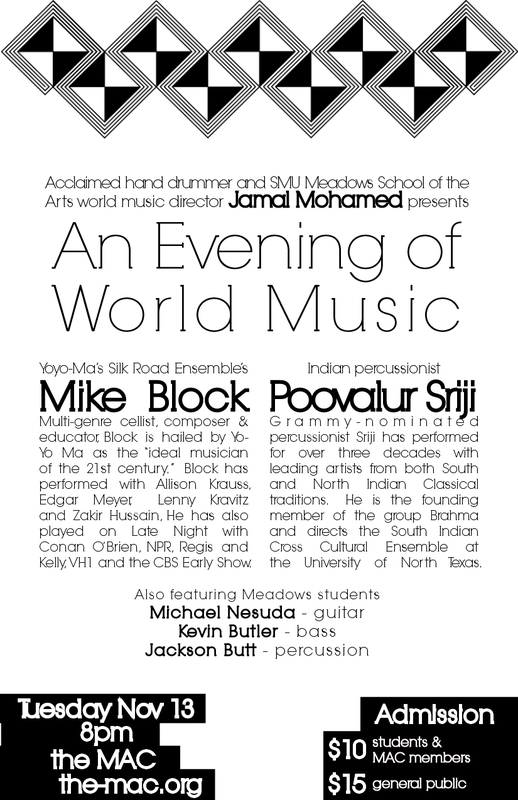 Jamal Mohamed, Mike Block, Cellist for Yo-Yo Ma’s Silk Road Ensemble, and Indian Percussionist Poovalur Sriji present An Evening of World Music at the MAC. Click here to view the flyer. 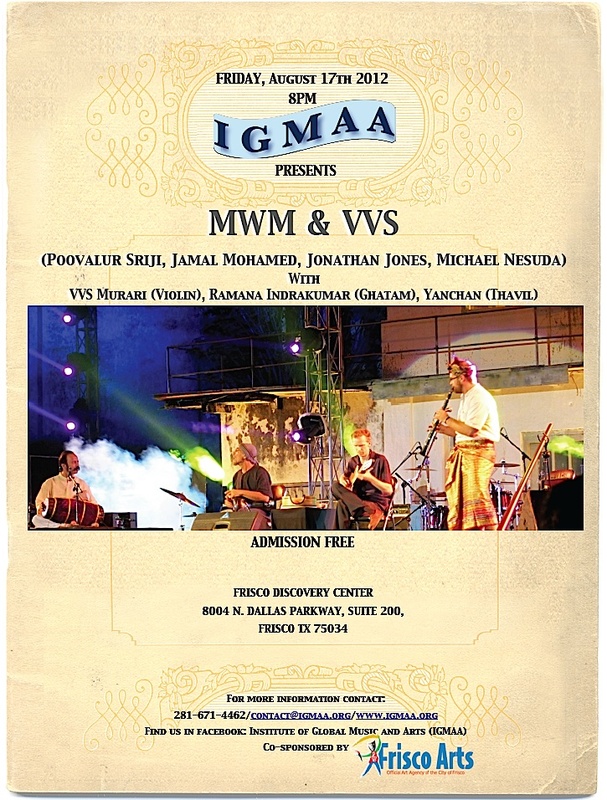 Don’t miss this special MWM concert feat. Jamal Mohamed, Poovalur Sriji, Sivarama Kodukula & Michael Nesuda as part of the Crow Collection After Dark. Enjoy World Music, tours of the exhibition, sweet treats from area food trucks, complimentary Asian beer & an evening completed with karaoke. Doors open 6:30. Concert at 8. Renowned cellist Mike Block, hailed by Yo-Yo Ma as the “ideal musician of the 21st century,” joins director Jamal Mohamed and the Meadows World Music Ensemble for an evening of music from cultures around the globe. Click here to learn more. The MAC is proud to present a contemporary music event: JAMPACT. Click here for details. An evening of music that will transport you to Bulgaria, India, Java….